My clay roaster is something that kicked around my kitchen for a few years before I figured out how to use it properly. (I have a habit of acquiring, but not always using, specialized kitchen equipment.) But since I’ve learned how to use my clay roaster, I can’t imagine my kitchen without it. I mean, we’ve used it twice in the last week alone. Ok, I admit, that was mainly because we had our final delivery of pasture-raised chickens for the year and I get quite excited about fresh roasted chickens. Clay roasters make the most awesome and fool-proof roast chicken dinner ever: moist meat, crispy breast skin, flavourful vegetables, stand-out gravy. It’s one-pot, minimal fuss, but looks like you’ve been slaving all day. Yum! 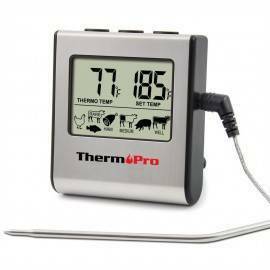 Clay roasters are designed to provide a sealed, moist environment for cooking. As the baking progresses, the clay roaster loses moisture until it provides a dry-roasting environment. Thus you get the seemingly impossible result of moist meat and crispy skin. (The vegetables will generally be just moist, but oh! so tasty!) If you have never tried using a clay roaster, or if you have tried and been unsatisfied, try again with my instructions. The only difficult thing about this recipe is remembering to start the prep about 2-1/2 hours before you want to eat. After that, dinner takes care of itself. I save this recipe for weekends, or for days when I am working from home. The clay roaster must be unglazed terracotta (the newer glazed ones will not work the same way). The roaster must be covered and soaked in cold tap water for at least 15 minutes before use, and once filled with food, it must be placed in a cold oven. Turn heat to high, and come back one-an-a-half hours later to a delicious cooks-itself meal. Remove the neck and giblets from the chicken cavity. Rinse the chicken well and pat dry. Set aside. Submerging the clay roaster in cold water. Clean out the sink. Plug it and place the clay roaster lid and bottom (nested inside each other) in the sink. 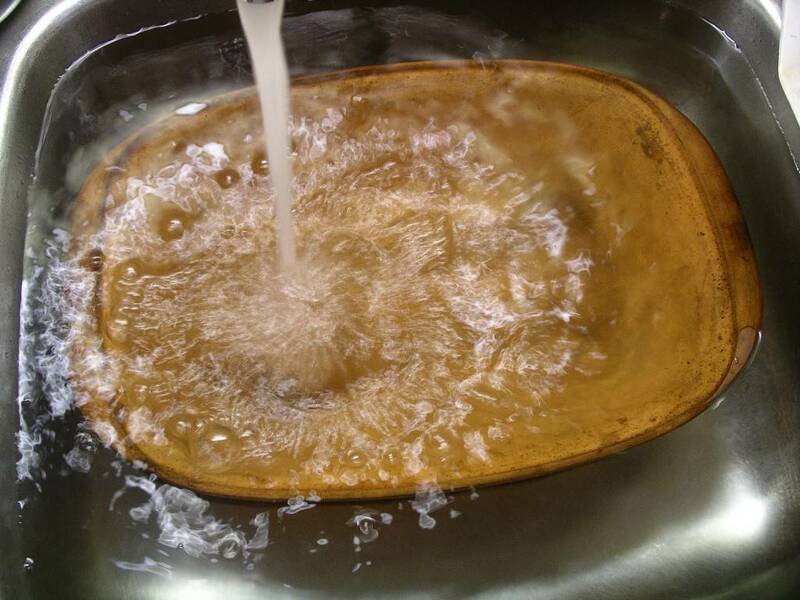 Turn the cold water on and fill the sink until both top and bottom of roaster are completely submerged. Let soak for at least 15 minutes. You can peel and cut the veggies while this soaks. Peel carrots and potatoes and cut into large pieces. 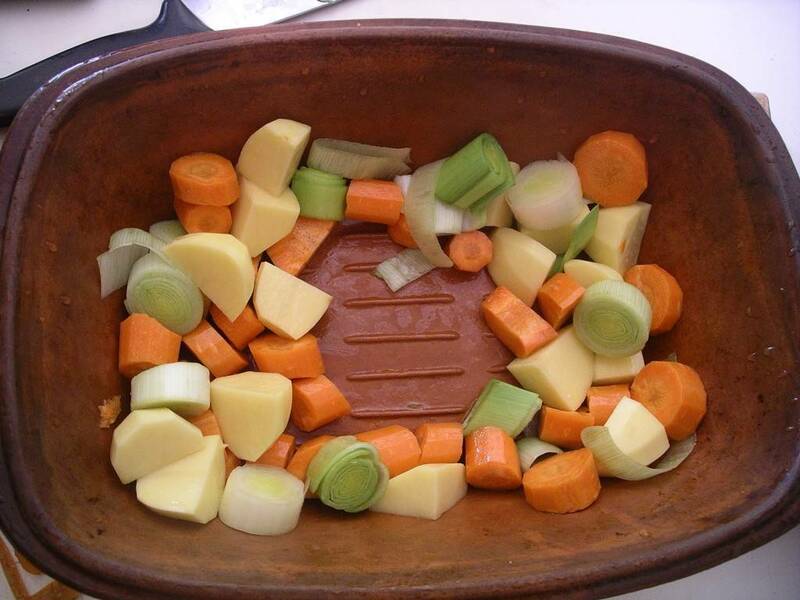 I cut the carrots into 2 cm-thick coins, and the spuds into quarters or sixths, depending on how large they are. If you use the leek or onion (leek!leek!leek! ), cut it into similarily thick coins (for the leek) or sixths (for the onion). Place the prepared vegetables in a mixing bowl and toss with the olive oil and salt and pepper. Smash the garlic with the side of the knife and chop roughly. Cut the through the herb sprigs into halves or quarters, and break the bay leaves in half. Stuff the prepared garlic and herbs into the cavity of the chicken. 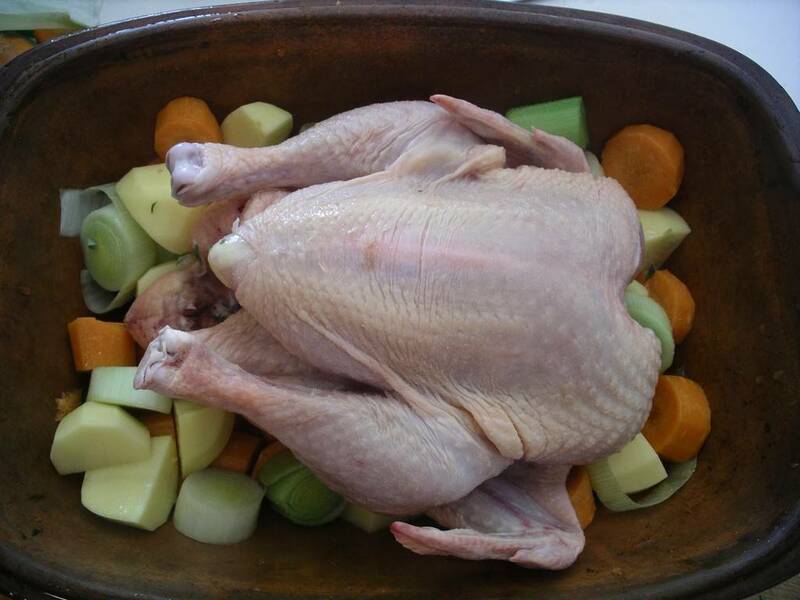 Place about one quarter of the perpared vegetables in the bottom of the clay roaster, pushing them to the side so that you have a bare spot in the middle of the roaster to place your chicken. …surround with remaining vegetables. 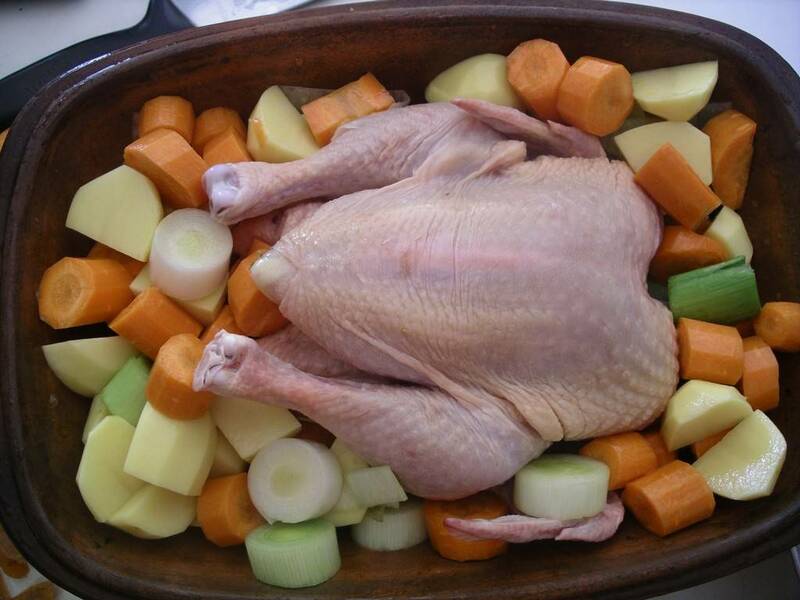 The breast and drumsticks should be above the level of the vegetables, but the side and thighs will be below. Don’t worry if some vegetables fall into the cavity of the chicken. Once you have everything nestled in there properly, sprinkle the top of the chicken with a bit of salt and pepper. Fit the top of the clay roaster over the bottom and place the whole shebang into a COLD OVEN (hot oven will make the soaked roaster crack). Close the oven door and turn the oven to 450 F.
Come back an hour and a half later (for a smaller chicken) or an hour and 45 minutes later (for a bigger chicken). Oh, all right, if you want you can come back at the halfway mark and rotate the roaster front to back. Remove the top and check the chicken for doneness. It will be cooked, but it may not be browned. 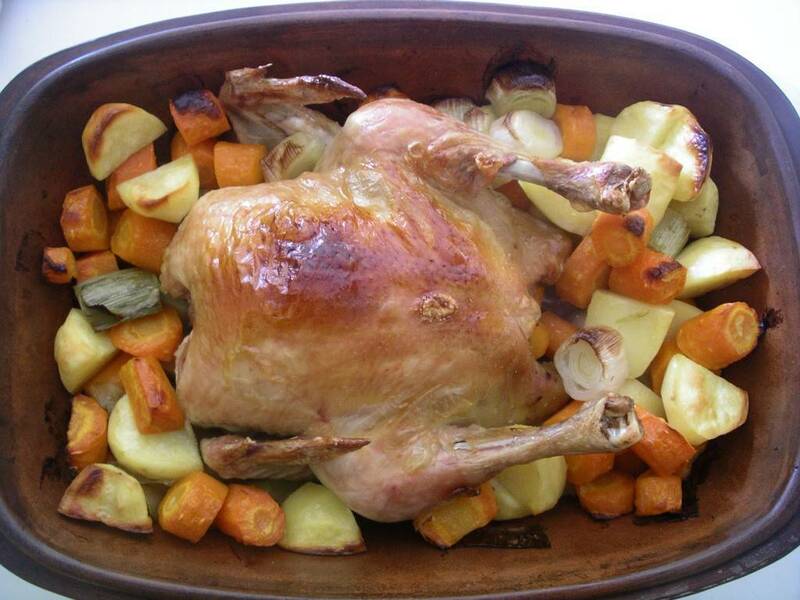 Although the lack of browning has never happened to me (the skin always looks perfect at this point – see that photo?) I have heard that some people like to remove the top and bake the chicken under the broiler for 5 to 10 minutes to promote browning and crispness. Use two forks or sets of tongs to lift and tip the chicken to empty its cooking juices back into the roasting pan; transfer chicken to a serving platter. Use a slotted spoon to gently lift out the vegetables to a strainer held over a bowl. Try to leave as much of the cooking juice as you can in the roaster, but some will come out in the strainer. Gently turn the vegetables from the strainer into a serving bowl. By this time, some chicken juices will have accumulated on the serving platter that the chicken was sitting on. Carefully tip these juices back into the roaster. 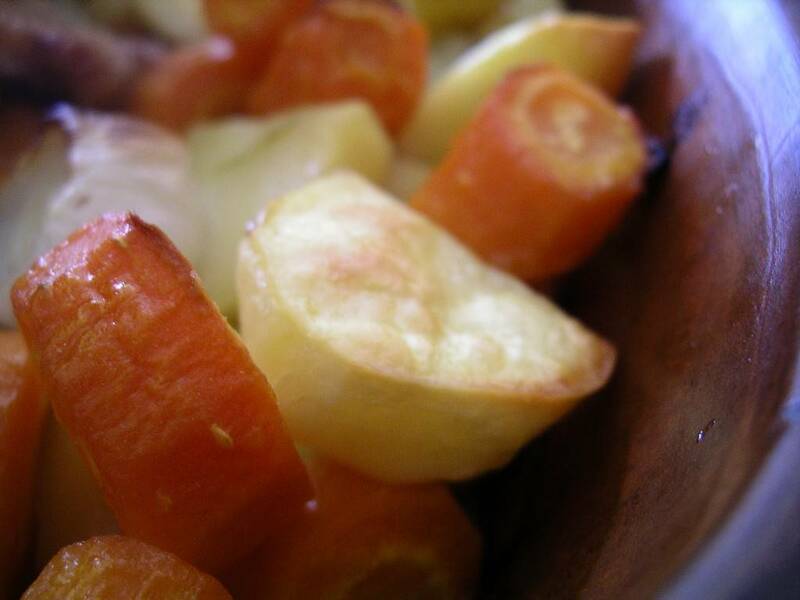 Put the juices strained from the vegetables back into the roaster. Set the veg and chicken aside while you quickly make gravy. Strain the chicken juices through a fine-mesh strainer into a large glass measuring cup. You will probably have about 1/2 to 3/4 cup. Add enough chicken stock so that you have about 1 1/4 cup total of gravy juice/broth/whatever you want to call it. Heat a small saucepan over medium-high heat. Add the butter or chicken fat (or other oil of your choice). Add flour and use a whisk (preferrably a flat whisk) to thoroughly mix the flour with the hot fat. When the mixture is smooth and nicely bubbling, add the chicken juices (be careful!). Turn the heat to high and cook, whisking constantly, until the mixture comes to a boil and gravy has thickened nicely. Remove from heat and stir in salt to taste. 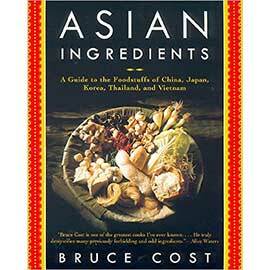 Feel free to add any sherry, cream, soy sauce, etc, that you like for flavour enhancement. Although I find that juices from a clay roaster usually need no enhancements. Carve the chicken, set out the veggies and gravy. Dinner is served. Enjoy! Is your roaster glazed on the inside and unglazed ont he outside? Looking at you photos, it looks like that is the case, or the roaster is well used and appears glazed. The reason I ask, is I have one of the uglazed outside/glazed inside and would love to try this recipie. Hi Shirley, mine in unglazed both in and out. It’s just been well-used. Unfortunately, the ones that are glazed on the inside don’t work the same way (at least as far as I know). It might be worth a try. Hi Heidi! Where did you get your roaster from? I’m intrigued now! I actually inherited my roaster from my Oma. 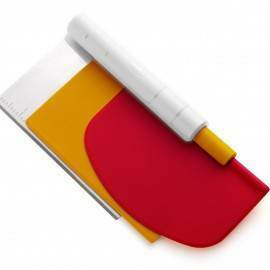 But you can buy them online through the Romertopf website or through other online stores. You may also be able to buy or order one through one of the various cooking shops in town. But make sure to buy an unglazed clay roaster! We got our Romertopf from http://www.romertopfclaybakers.com. I think they have some of the best prices. They told me most of the online stores source from Reco directly, so it really just comes down to finding the best deal. We love the flavor of the chicken that comes from clay cooking. Just got an unglazed Romertoph at the Salvation army for 4$! Can’t wait to try out your recipe. Hi Heidi– I know this is an old post, but I just stumbled across it last weekend when looking for directions to use a clay cooker (that I scored at a thrift store for a buck). I used a brined, organic chicken and followed your directions to the letter– it turned out the best roasted chicken and veggies (and gravy!) I have ever made and I just wanted to thank you for this so much. Also, I surfed your gluten free recipes and followed your almond milk recipe (exactly) for the most amazing almond milk ever. These two items will be new staples in my home. Hi Stephanie – thank you! I so appreciate hearing from readers,and I’m happy that you took the time to write! I work hard on my recipes and I’m glad that both the chicken and the almond milk recipes worked out so well for you. i was wondering if you could start the roasting on trivets on a wood stove and after it warmed up put it on the stove to finish the cooking . i know it would take longer.would you have to put a metal box over the top to serve as an oven? I’m not sure how that would work on a wood stove, but using the trivets and the metal box sounds like it would work to replicate an electric oven. Looking forward to making this tonight. I just popped my recently acquired clay roaster into the oven and can’t wait to see the results! I didn’t have sage or thyme on hand, so I subside poultry seasoning and I hope that works out. Thank you so much for your recipe! You are welcome! How did it turn out?